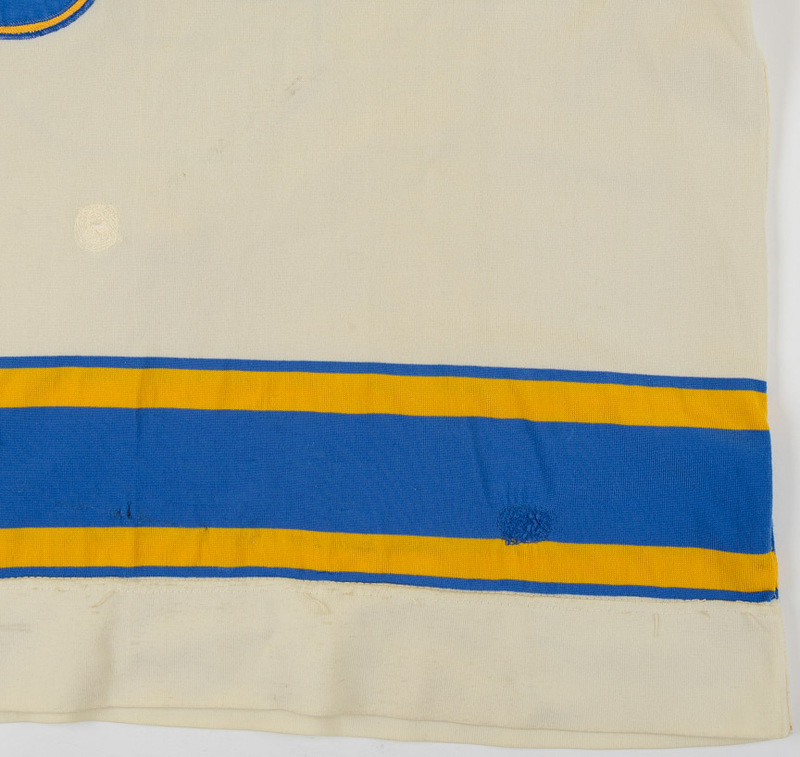 This road white dureen gamer by Wilson and Giesler-Jorgen Sporting Goods was worn by Bob Plager during the 1969-70 NHL season. Plager’s NHL career began in 1964-65 with the New York Rangers, his home for 3 seasons. The St. Louis Blues made a deal to acquire Bob as they were forming their expansion team in 1967. Bob would get to play alongside his brothers Barclay and Bill in St. Louis as the Plager’s became St. Louis’ royal family. In each of his first 3 seasons in St. Louis, Plager and his Blues trekked to the Stanley Cup Finals, falling just shy of Stanley Cup glory each time. This devastating hip checker and resident tough guy would spend 11 seasons in a St. Louis uniform, retiring in 1978. A member of the Blues organization to this day, Bob served briefly as the Blues Head Coach and won the Turner Cup in his only season as the Peoria Rivermen’s Head Coach. 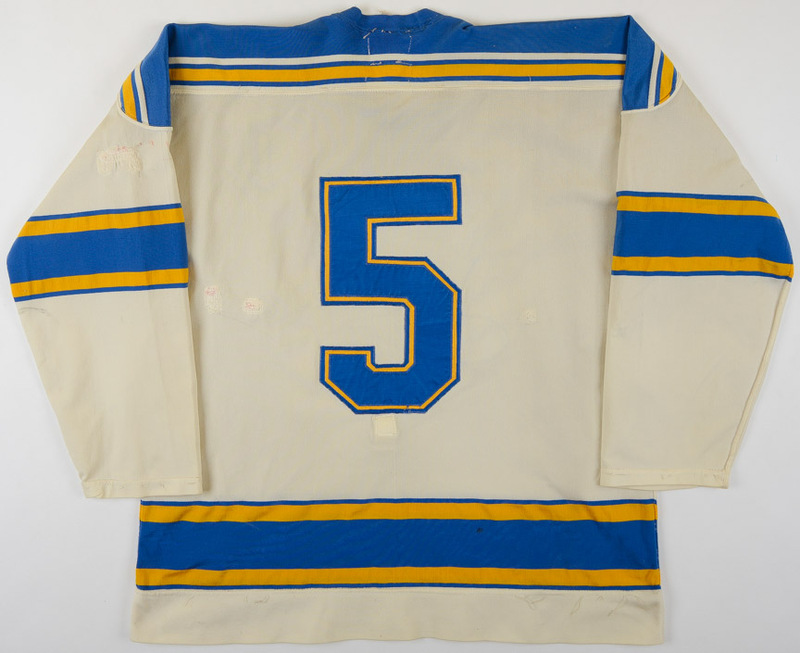 A member of the St. Louis and Missouri Sports Hall of Fame’s, and with 50 years of service to the franchise, in 2017 the Blues paid homage to this legend by retiring his #5 to the rafters. Proudly sewn to the left breast of this gamer is the alternate Captain’s “A”. The game wear on this sweater is solid and consists of stick and slash marks, board burns, board paint transfer, un-repaired burn holes, fine inner pilling, fight abuse with stitch pops and a trauma-laden collar as well as more than a dozen team-sewn repairs! 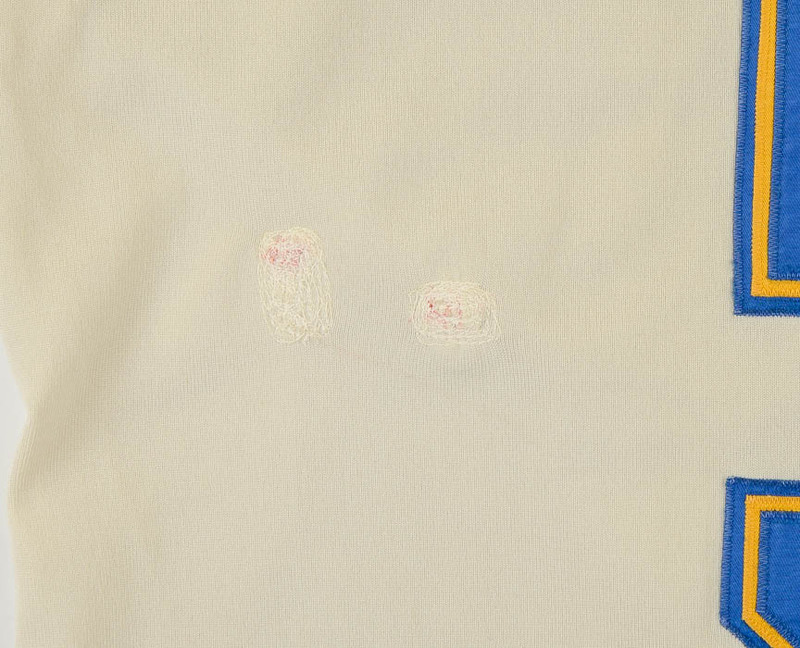 Sewn to the inner verso is the original loop style fight strap. 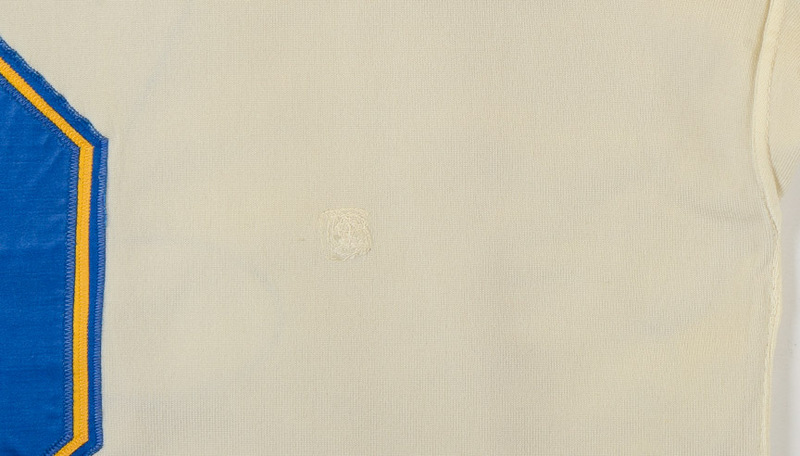 This vintage example hails from the brief era that saw the Blues play without sleeve numbers! Incredible provenance accompanies this early St. Louis gamer. Our consignor has had this jersey put away dating back to the 1970’s when he acquired it directly from former Blues equipment man, Tommy Woodcock who offered it to him in thanks for service at a team event. 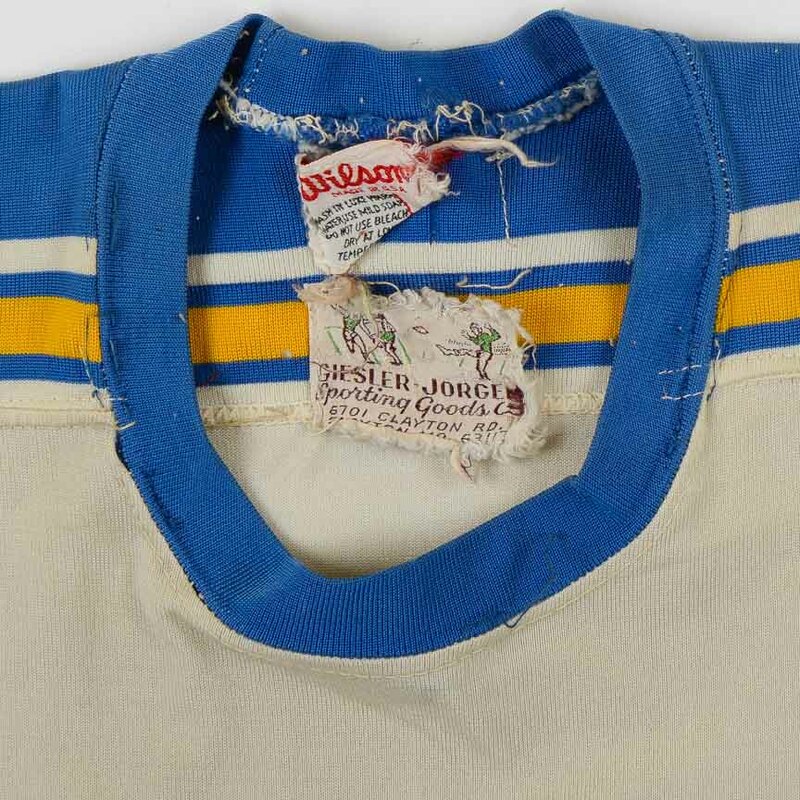 This is the first Bob Plager game worn jersey that we’ve ever handled and is to our knowledge the first to ever come up for bid at Major Auction. 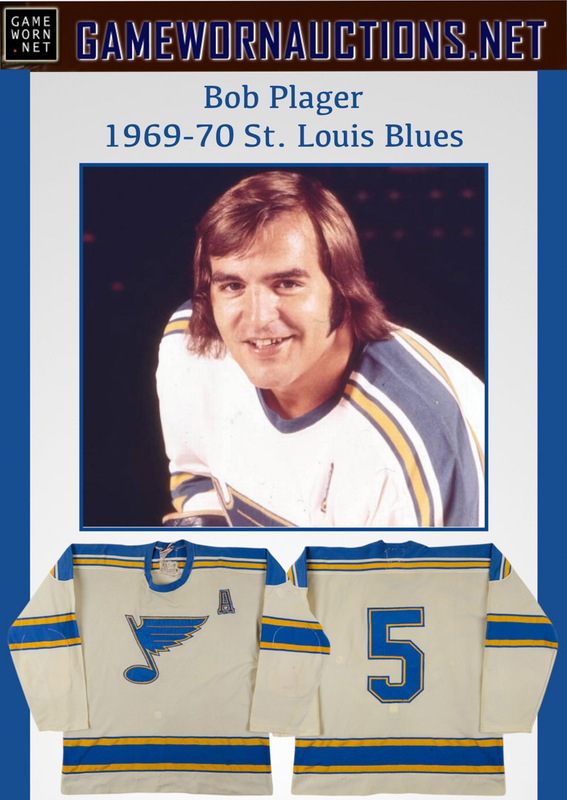 This hobby rarity is a completely fresh offering that features tremendous game use and was worn by this legendary member of the St. Louis Blues royal family during the early days of the franchise, choice!